The Supreme Court has agreed to hear the petition filed by the Kerala Union of Working Journalists (KUWJ) seeking directions to open media rooms attached to the high court and other courts in Kerala, on October 21. The petition was mentioned by advocate Wills Mathews before the Bench comprising CJI TS Thakur, Justice AM Khanwilkar and Justice D.Y Chandrachud on Thursday. The CJI has initially told the petitioner to approach the high court. “It is basically a dispute between the Bar and Media and should be settled by the high court of Kerala”, said the CJI. But the petitioner expressed the difficulties in approaching the high court because of the hostile atmosphere existing on the high court premises. The petitioner also expressed the need of an effective mediation for settling the disputes on a permanent basis. The petition also sought a direction to the Registrar to provide for safe and dignified access to courts and working atmosphere on the court premises. According to the petitioner, the cause of action for filing the present writ petition arose on 20.7.2016, when the media room at the High Court was closed and journalists were denied entry to the court premises and this continued on each and every date when the members tried to enter the court premises. According to lawyers, the issue started when an incorrect report appeared in a newspaper regarding the proceedings of the association, which had passed a unanimous resolution condemning police atrocity on a lawyer. A national daily had reported that the said meeting was deferred due to difference of opinion. When this wrong reporting was pointed out to the concerned, it was stated that certain media persons with no accreditation allegedly used abusive language against lawyers. This led to a scuffle between lawyers and the said persons. 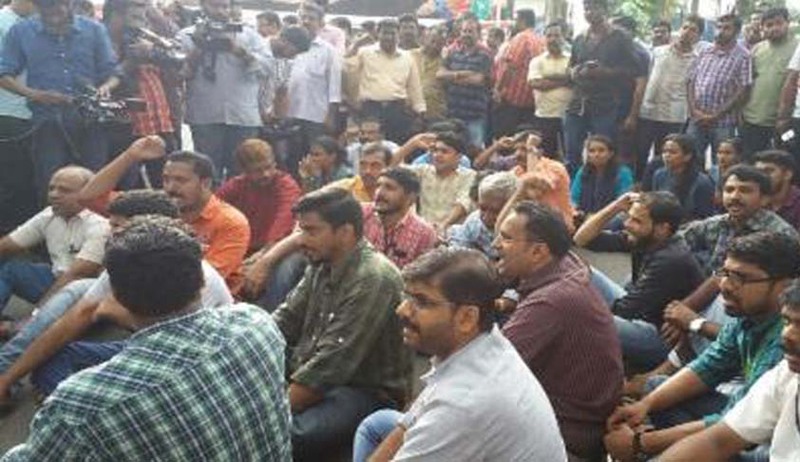 The lawyers were, thereafter, allegedly manhandled by media personnel. A group of media personnel allegedly assembled near High Court Advocate’s chamber complex and raised slogans against the lawyers. It is also stated that said persons also pelted stones at lawyers, causing injury to one of them. Later, after a joint meeting chaired by then Acting Chief Justice Thottathil B Radhakrishnan and committee constituted to formulate a Code for Court reporting by the press and electronic media, the High Court of Kerala issued a press release stating that there was no ban imposed on journalists from attending court room proceedings. The meeting also decided to formulate a Code of Conduct, which had to be mandatorily followed, in relation to reporting of court proceedings. It was also made clear that individual judges would be at liberty to decline access to any person to their chambers and offices of private secretaries and personal assistants, including personal assistants attending to the court work of that judge from the personal assistants’ pool. Last week also, the present Chief Justice and the Registrar had reiterated that there is no ban for reporters in the High Court. But, on last Friday, some journalists alleged that they were prevented from covering proceedings in the court of Chief Justice Mohan M Shantanagoudar.